The US military’s Bagram detention facility in Afghanistan is hidden behind a wall of secrecy and considered by many to be more questionable than the detention facility at Guantanamo Bay, Cuba. Debra Sweet, the director of The World Can’t Wait, said that those held at Bagram are unknowns – who they are is not disclosed, and the charges they face are not disclosed. “The world wants to know who is being held there and why,” said Sweet. There are allegations of secret prison practices, harsh interrogations and conditions far worse than those at Guantanamo Bay. The Obama administration refuses to make public details about the detention facility, and also continues to deny habeas corpus rights to those held there. “The argument that the Obama administration is making, as I understand it, is this is an active warzone, therefore we don’t have to give rights that anyone on US soil would be guaranteed,” said Sweet. 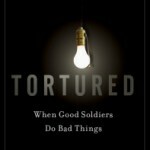 The Berkeley Says NO to Torture Week began Sunday October 10 with a book talk by Andy Worthington who wrote The Guantanamo Files:The Stories of the 774 Detainees in America’s Illegal Prison, and Justine Sharrock, author of Tortured: When Good Soldiers Do Bad Things. Even for people who have followed the US detention of men at Guantanamo, the stories of the real people involved; both those detained, and those who were part of the functioning, are eye-opening and heart-breaking. Andy, who knows as much or more about the individual stories of the men detained at Guantanamo, reminded everyone of the reason we’re doing this Week in Berkeley: John Yoo is here teaching law at Cal, as he has been since 2004, when he returned from his two years spent in the Bush White House arranging the “legal” justification of torture and indefinite detention. 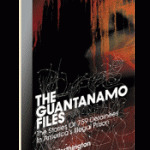 Why stay on the issue of the closure of Guantanamo when, for the time being, it’s disappeared off the radar? “Just because something’s gone on for far too long, doesn’t make it less wrong,” Andy says. He gave a quick overview of Guantanamo, 20 months after Barack Obama said he’d close it in 12 months. 598 men have been released with no charges, mostly by the Bush regime. 174 are left. Of those, the Obama administration plans to charge 35 and try them under the “new” military commissions. 48 are to be held indefinitely — no charges, no trials, no release, in legal limbo. The rest are all “approved for transfer,” a phrase this administration picked up from Bush, as opposed to “approved for release” which could indicate they were held without reason. Andy pointed out that the U.S. has prevailed on 15 countries to take detainees after release, but that the U.S. – the country which detained the innocent men – won’t take any. The vast majority of the 774 men were not caught on the battlefield, as the Bush regime said at the time, but were bought for bounty. The US government didn’t know who they had, why, or what any of them might have done. General Dunleavy, the first general in charge in 2002 when Guantanamo opened, called a lot of them “Mickey Mouse” prisoners, held without reason. Nevertheless, while held, one in 6 of them got the “full treatment” of enhanced interrogation procedures, both physical and psychological that we now know to be the Bush/Yoo package of torture. Andy did not confine his criticism to Bush, who came up with the term “enemy combatant,” but described for us what the Obama administration has done, and not done. The term is new: “unprivileged enemy belligerents.” They have habeas corpus rights, but still, many are not being released, much less given an apology or any sort of compensation. See a post from Andy on October 11, Former Guantánamo Prisoner, Tortured by Al-Qaeda and the US, Launches Futile Attempt to Hold America Accountable. 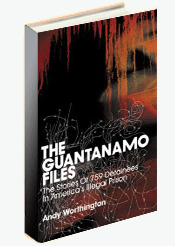 Justine Sharrock got to know four men who were involved in torture of detainees at Abu Ghraib and Guantanamo. She writes with much understanding, developed over time with the men, for how they have been destroyed by participating and being trained as part of dehumanizing package of detention and torture. She read from her book about Chris Arendt, an anarchist, Jack Kerouac-reading punk from the Midwest who somehow ended up in a National Guard unit sent to Guantanamo. As he learned the pattern of detainee abuse, like the “frequent flyer” program where detainees were moved every few hours to a different cell for months, he began folding the order forms into origami birds which spilled over his whole desk. He tried to kill himself. 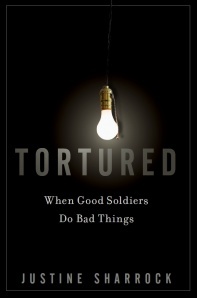 Justine’s work on how torture was shaped, and has come to be accepted, is really important. She and Any will be speaking again at a program Wednesday about writers on torture. Lauro Vasquez, a recent graduate of Dominican College read two of his poems. A member of the Revolutionary Poetry Brigade, he told how he started thinking in poems while working as a dishwasher at college. I’m going to ask him for the poems to post here. Nine years old this coming week, the U.S. occupation of Afghanistan is in the news for 1) Pakistan attacking NATO supply convoys crossing their border into Afghanistan because a NATO airstrike killed 3 of their soldiers; 2) a book by Bob Woodward reveals severe splits at the top of the U.S. government, and in the military, over what to do about the failing war, and 3) hearings at Ft. Lewis-McCord on charges that members of an Army Stryker Brigade engaged in killing Afghan civilians for sport. Protests aimed at stopping war occupation are planned for this week, in New York City, for October 16 in Chicago, and elsewhere we’re urging people to show the Collateral Murder video. One protest to be seen by millions is the ad signed by 2600+ to be published in The New York Times later this week. Winfield is one of five soldiers in an Army Stryker Brigade from Joint Base Lewis-McCord, near Tacoma, that the Army has accused of being involved in the murders of at least three civilians in Afghanistan between January and May. Details have emerged about rampant drug use in Winfield’s platoon of around 30 soldiers, and of troops posing for photos with corpses. Soldiers in the unit say the alleged ringleader in the murders, Staff Sgt. Calvin Gibbs, severed and collected body parts, including teeth and fingers, apparently to make a necklace. Members of the platoon allegedly used drop weapons to cover up their crimes. It’s too early to blame what occurred in Winfield’s platoon on soldiers’ moral compasses spinning out of control after repeated, violent tours in Iraq and Afghanistan (Gibbs was on his third combat tour). But it is easy to imagine that seemingly endless wars contributed to the moral turpitude Winfield described to his father. It’s no stretch to say that the pervasive climate created in this country after 9-11 that anyone living in the war zone was an “enemy” led to mass killings in Iraq, Afghanistan, and now is standard operating procedure for US/NATO conduct towards Pakistan. Army basic training where recruits were led in jodies of “kill the hajis” lead to killing Afghan civilians. Ethan McCord, who exposed and opposed his orders to return 360degree fire and many other returned vets tell us about what they were ordered to do. Afghan civilian deaths are up; U.S. casualties are up, and no end in sight. But hey, it’s really your problem, according to Barack Obama, campaigning for Democrats this fall. At the end of an interview with Rolling Stone last month, he came back into the room, and pointedly went after “any Democrat or progressive” who is complaining about what he’s not gotten done. We have to get folks off the sidelines. People need to shake off this lethargy, people need to buck up. Bringing about change is hard — that’s what I said during the campaign. It has been hard, and we’ve got some lumps to show for it. But if people now want to take their ball and go home, that tells me folks weren’t serious in the first place. I feel insulted by Obama’s remarks, for all those progressives who, serious about change, voted for Obama, under the delusion that he represented real change. Here you have a leader who’s dead serious about commanding the US empire, with all that implies, chastising his base because they allowed themselves to be bamboozled. And they want you to go for it again. Hmmmm. We were here, against the crimes of the Bush regime. It’s just that you have to be consistent if you really are serious about stopping these unjust, immoral wars. I’m looking forward to seeing those outrageous mugshots side by side in The New York Times this week. Imagine the discussion at breakfast tables across the country.